My friend Nan is an amazing cook. I’ve had many wonderful dinners at her house. She introduced this stuffing to me and I’ve made it every year since. There are a number of things I love about this recipe… it works with either cornbread or white bread. Nan, in fact, uses both to great effect. And while it is indeed wonderful with pancetta and sausage, we both substitute in soy chorizo, which is shockingly good and creates a stuffing that pleases the meat eaters yet is vegetarian friendly. As with any stuffing recipe, it is hard to screw up. I’ve simplified her relatively easy recipe even more to make it as user friendly as possible. Oh and, yeah, I’ve simplified it also because I am lazy. 3 cups stock (chicken or vegetable, depending… click here to make easy homemade stock. It really does make a difference. 1. Cut or tear the bread into bite sized pieces. Some people like to cut. I myself tear, I like the rustic look. (Did you know “rustic” means “lazy”?) Spread the pieces on 2 baking sheets and dry out in a 250 degree oven for an hour. Place in a large bowl when cool. 3. Heat 12 inch skillet over medium-high head until hot. Add 2 T butter and swirl to coat pan. When foam subsides, add your meats or soy chorizo or whatever combo and cook, stirring, until it loses it’s raw color. Remove to a bowl. If you use chorizo, wipe the pan relatively clean so your veggies do not turn orange. 4. Add 4 T of butter and saute onions and celery until softened. As they cook, add salt and pepper liberally, and your herbs. After 5 minutes, add the garlic. Cook on medium heat until all is soft. 5. Add this mixture to the meats/chorizo, then toss with the bread mixture. 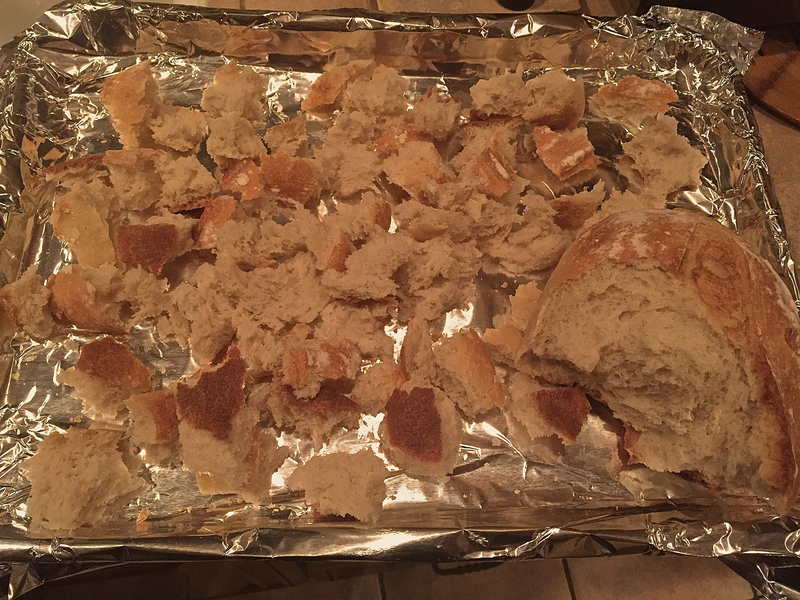 Toss gently so some of the bread remains in full pieces and does not mush. Taste! Do you need more seasoning? Add it. 6. Cover bowl with wrap and let sit an hour, or 4 hours, or overnight, whatever you have time for. 7. Preheat oven to 400 degrees. Butter a large rectangular baking dish. Pour in stuffing and any remaining liquid. Bake until golden brown, 35-40 minutes. 8. If making ahead, bake fully, then keep in fridge or freeze. If you freeze it, let it thaw overnight. Either way, pad with butter, all over, when you reheat. Note: Eliminate the meats/chorizo and you have a wonderful basic stuffing recipe here, ready for any kind of flavor twist. Where I grew up, on the gulf coast of Texas, the idea of fruit in stuffing was anathema. I could never imagine it! I’d hear of people putting, say, apples in stuffing and think, “What??? They must be a Yankee!”, about as bad a thing a Southerner can call, well, anyone! So the fact my friend Jan has converted me to making a stuffing that does indeed contain fruit is pretty amazing. This is a terrific stuffing!! I would be making it this year, along with Nan’s version, but Jan is bringing her version to the meal! This is a wonderful addition to any table. 2 pans of cornbread. For the best cornbread in the world, click here. 1. Bake your cornbread. Let it cool. 2. Melt 1/2 c. butter in a huge skillet or Dutch oven. Sauté the onions and mushrooms and celery until soft. 3. Add chicken broth and spices and bring to a boil, then reduce heat. 5. Crumble the cornbread into a very large bowl. Add the sausage. Snip in the figs (I quarter them). Add the Craisins, if using, the apples and pecans (set some stuffing aside into another bowl if you have people coming with food allergies). Pour the chicken broth/onion mixture in and mix all together. 6. Turn the whole mixture into a casserole dish and bake till warmed through — about half an hour at 350°. My mom always made dressing in a big pan because she also was grossed out by stuffing the turkey. We always loved it because of the crispy edges! I found that whole wheat Challah bread makes terrific dressing, and always add turkey sausage, chopped apple, dried cherries, and toasted nuts along with the usual ingredients. Some heavy cream added with the eggs helps the mixture puff up and lose some of its density. For the last couple of years, I have substituted apple cider for a portion of the broth. Thanks for this post, Tom. 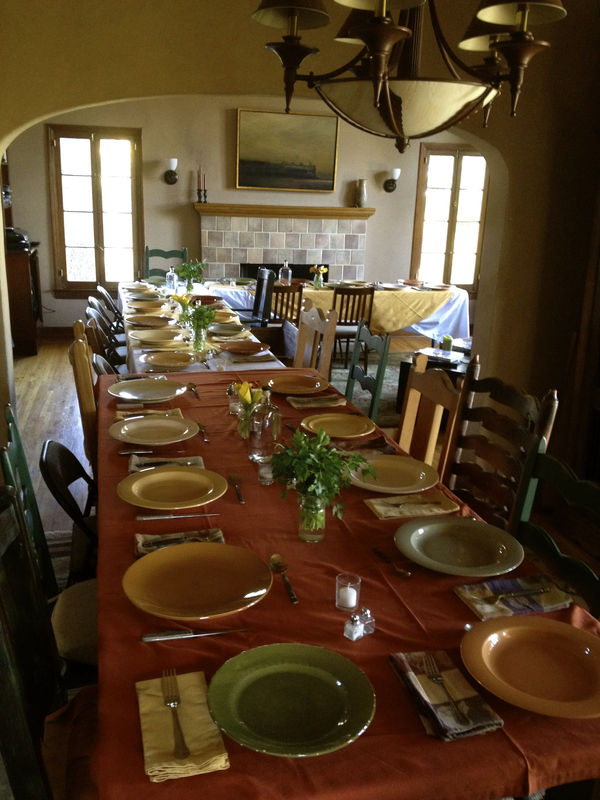 I had hoped to be cooking my first Thanksgiving here at the new house, but am now waiting to break in our dining room at Christmas. I may have to break down and make a turkey for Christmas Day instead of Beef. 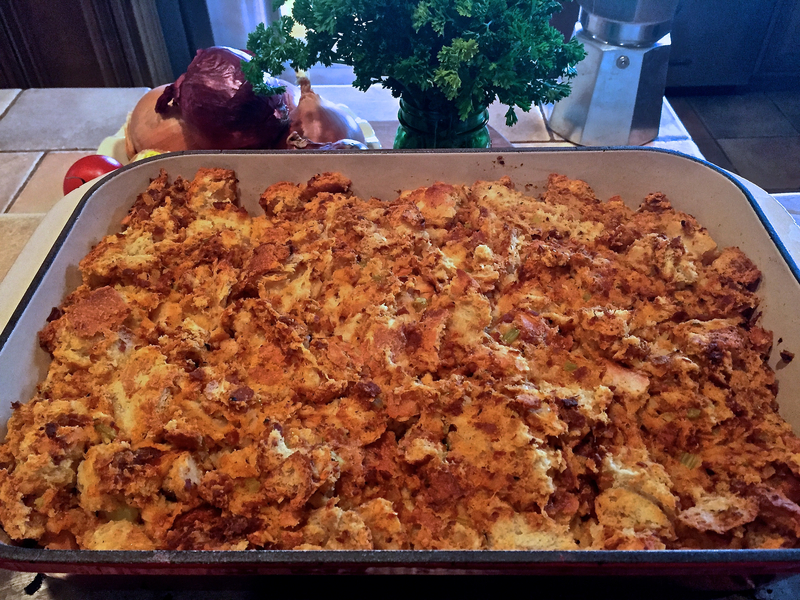 I grew up with my Aunt’s mother’s amazing cornbread stuffing (always made in a casserole dish, not in the bird), I still love it and try to recreate it. However, Nan’s Soy Chorizo stuffing is a very close second. Can’t believe I will miss that this year! Thanks for the shout-out, Tom. I am making the chorizo stuffing right now, and decided to use your simplified version – although I think I’m going to add the pancetta to the soy chorizo. No vegetarians at the table this year. Happy Thanksgiving! You have no idea how much I wish I had pancetta in mine 🙂 let me know how it turns out! And a picture!